The rumored third playable character for Mega Man 10 has been revealed, with powerful abilities that might outshine those of Mega Man. When Mega Man 10 was first announced back in December 2009, it was known that players would be able to control both the blue bomber himself and second playable character Proto Man. A third was rumored, which has now been revealed as Bass, a Mega Man rival created by Dr. Wily. Though he's appeared in entries from the Mega Man series before, now he's been turned into an 8-bit sprite for the first time. Bass has seemingly superior abilities to that of the man that is mega. His Bass Buster unloads faster than the pitiful Mega Buster, can fire in seven different directions (including upwards and diagonally), and can even shoot down enemy attacks. Bass can also dash to avoid attacks and has his own mechanical dog, similar to Mega Man's Rush, named Treble that can increase his abilities and allow him to fly around. All in all, he sounds like Mega Man 10 on easy mode. 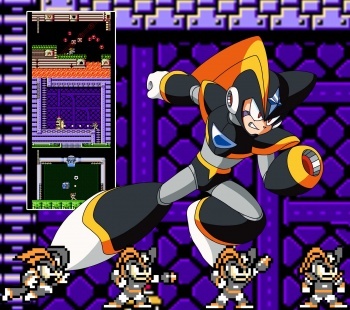 The new black-orange-grey bomber will be available as DLC for the Xbox Live Arcade, PlayStation Network, and WiiWare versions of Mega Man 10 all on the same day: April 5. The Bass DLC pack will cost a measly $2.00, converted to whichever kind of pretend points are required for purchase. More DLC is also planned according to Mega Man 10's WiiWare page, including three special stages and an endless attack mode. Mega Man 10 is already available in North America on WiiWare, with PSN and XBLA releases to follow by the end of March.